First Line: He dressed the boy's body whilst it was still warm. It's 1956 in the Highlands of Scotland. and the village that the Highland Gazette calls home probably believes it's filled with modern thinkers. After all, Italians and Poles have moved into the community, opened businesses, and been accepted by the villagers. Unfortunately, when the body of a young boy is pulled from a canal, everyone finds that they aren't quite as modern as they wanted to think. Gossip is rampant, and suspicions are cast at any newcomer to the area. The editor of the Gazette wants to change the sleepy paper into something with more hard-hitting news. He believes that he and his staff are going to be able to help the police in their investigation. What he doesn't know is just how much this investigation is going to change his staff and the community. This book begins slowly and proceeds with great care in setting up the cast of characters and the area in which everyone lives. Once or twice I had a fleeting thought about when they were going to start focusing on the murder, but that's all they were: fleeting thoughts. A.D. Scott is masterful at setting her scene and each of her characters is built, brushstroke by brushstroke, with great care. A Small Death in the Great Glen is as much a character study as it is a mystery, so if you are a character-driven reader, this should definitely be your cup of tea. The staff of the Highland Gazette is a brilliant bunch of characters-- every one fascinating in his or her own way. We have an escapee from the big city of Glasgow, the old Eternal Cynic, the cub reporter dreaming of his first big break, and an abused wife. We get to know each one during the course of the book, and each one is going to have a part in the investigation. We're teased along with bits and pieces of the murder investigation, and a clue is left out in sight here and there, but once A Small Death in the Great Glen settles down to find the killer, the ride to justice is filled with twists and turns. I thought I had it all figured out-- but I only had it half right. Another thing I liked is that, although things are deadly serious, Scott lightens the tone with laugh-out-loud funny bits throughout. I know that once I've had a laugh about something the next shocking thing that happens hits me that much harder-- and makes me that much more reluctant to stop reading. 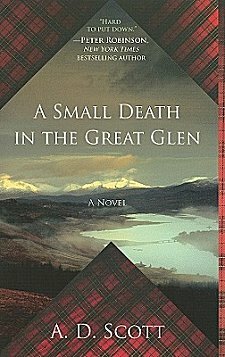 If you're in the mood for a mystery that builds slowly to a climax while it paints a vivid portrait of life in a provincial Scottish village AND creates a marvelous cast of characters, I'd say you were in the mood for A Small Death in the Great Glen. The next book in the series is due to be released at the end of September, and you'd better believe it's on my wishlist! Cathy - Historical mystery? Character driven? A solid mystery with humour, too? Sign me up! Me too! You know a Highland mystery is just the ticket for me. Cathy, this is my favorite mystery! I loved the charm of the Scottish village, the multifaceted themes going on and more than anything I loved the characters! The ending was such a change from most mysteries too, a little shocking. I can't wait for the next book, have it on preorder! I got this one unsolicited and didn't think much about it until I read your review. I need to pull it out of the stacks! When you give something an A+, Cathy, that's enough for me. Forget my TBR LIST - it went straight to being reserved at the library - and I'm first in the holds queue. Can hardly wait! THANKS! Barbara-- You and I love the Highlands. It was the major reason why I picked up the book in the first place. Peggy-- I'm happy to meet a fellow fan! The Winter Sea by Susanna Kearsley! Didn't like it as much as you did, but I still enjoyed reading it. I will definitely be reading the next book in the series. Peggy-- I've got that book sitting on my TBR shelves. I've read at least one other Kearsley novel and enjoyed it. Thanks for stopping by! I'm headed to amazon right now! My kind of book. This is wonderful news for me, Dorothy! I hope you enjoy this book as much as I did.